It once owned more than a quarter of the publisher. Vivendi has finished selling off its final shares in Ubisoft, completing the deal that was announced last year when the publisher avoided being taken over by the conglomerate. It once owned more than a quarter of the company. The remaining shares represented a 5.9 percent stake. “Vivendi is no longer a Ubisoft shareholder and maintains its commitment to refrain from purchasing Ubisoft shares for a period of five years,” Vivendi announced. 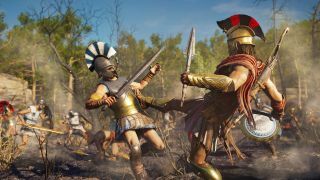 It's quite the turnaround, and just over a year ago it was hungrily eyeing up Ubisoft, despite protests from the publisher and Yves Guillemot, its CEO and co-founder. The threat of a corporate takeover seemed very likely, with Guillemot even pleading with the Canadian government to stop it. Instead, they managed to come to an arrangement, with Vivendi selling 30,489,300 shares for $81 each. It's made a capital gain of $1.2 billion out of the deal, selling the shares for a total of $2 billion. This doesn't mark the end of Vivendi's ambitions in the game industry, however. It took over mobile game publisher Gameloft in 2016 and confirmed that it will continue to "strengthen its position in the video games sector".